The Palace of the Legion of Honor in San Francisco surprises French visitors by the words written on the pediment of the main entrance : Honneur et Patrie. 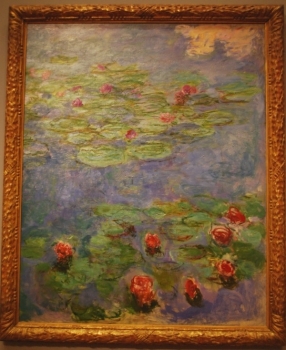 Surprises continue with its beautiful collection of European art including five gorgeous Monets. The biggest one faces visitors at the end of a perspective through several large rooms. It deserves this honor. This enormous canvas of Monet’s late period, painted during World War One, is certainly one of the most splendid masterpieces of the museum. Monet focuses on two patches of water lilies floating on the pond in his garden at Giverny. Unlike many of the paintings in this series, this canvas is very bright. Vibrant reds and pinks pop out the flowers, contrasting with the soft greens of the lily pads and the pale blue of the reflected sky. Curiously enough, a cotton like cloud occupies the upper corner of the painting, when it should be reflected at the lower part of the canvas. It is one of Monet’s favorite game to mix all the landmarks to create confusion in the eyes of the viewer.